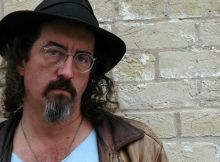 James McMurtry (born March 18, 1962 in Fort Worth, Texas) is a Texas Rock music singer-songwriter, and occasional actor. In 1987, a friend in San Antonio suggested he enter the New Folk songwriter contest. He was one of six winners that year. John Mellencamp was starring in a film based on a script by James's father, which gave James the opportunity to get a demo tape to Mellencamp. Mellencamp subsequently served as co-producer on McMurtry's 1989 debut album, Too Long in the Wasteland. McMurtry also appeared on the soundtrack of the film Falling from Grace, working with Mellencamp, John Prine, Joe Ely, and Dwight Yoakam in a "supergroup" called Buzzin' Cousins. McMurtry released follow-up albums in Candyland (1992) and Where'd You Hide the Body (1995). Walk Between the Raindrops followed in 1998 and 2002 brought St. Mary of the Woods. In April 2004, McMurtry released a tour album called Live In Aught-Three. In 2005, McMurtry released his first studio album in 3 years. Childish Things again received high critical praise, culminating in him winning the song and album of the year at the 5th Annual Americana Awards in Nashville, Tennessee. The album was perhaps McMurtry at his most political, as his working-class anthem "We Can't Make It Here" included direct criticism of George W. Bush, the Iraq War, and Wal-Mart. McMurtry released his follow up album to Childish Things in April 2008. Just Us Kids continued with the previous album's political themes and included the song Cheney's Toy, McMurtry's most direct criticism of George W. Bush so far. Like We Can't Make It Here from the previous album, Cheney's Toy was made available as a free Internet download.